Anthony Dymoke Powell (pronounced to rhyme with Noel) was born in London and educated at Eton and Balliol College, Oxford. He worked for the publishing firm of Duckworth, and then as a scriptwriter for Warner Brothers. During the Second World War he served at first in the Welch Regiment and later in the Intelligence Corps as a liaison officer working with Polish, Belgian and Czech military establishments in London. Literary Editor of Punch 1952–8, he has long been a reviewer for The Times Literary Supplement and other papers. He published five novels before the war, but his reputation rests on the twelve books, published between 1951 and 1975, which make up one novel, A Dance to the Music of Time. Their narrator Nicholas Jenkins recalls his life, from childhood in 1914 to the early 1970s, and the lives of friends and acquaintances in various overlapping upper-class, literary, bohemian, military and political circles. 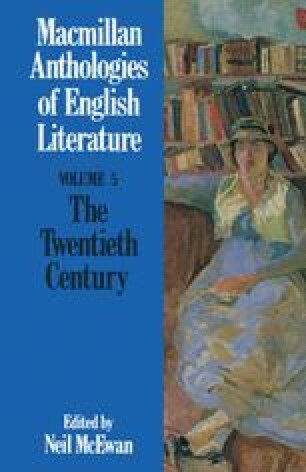 The novels are full of amusing anecdotes and gossip but they are carefully planned and the whole work offers a complex and mature appraisal of modern England. Powell has also published John Aubrey and his Friends (1948), two plays, The Garden God and The Rest I’ll Whistle (1971), and an autobiography in four volumes, To Keep the Ball Rolling (1976–82).